Surprisingly, we haven’t published an image of the second Bay store that sat on a prime piece of CPR land at the corner of Granville and West Georgia. The first Bay store was closer to the early city, built on Cordova Street around 1887, a location they only retained for eight years. Presumably, once it became apparent that CP’s efforts to move the centre of the city’s action westward to Granville Street were paying off, the Bay decided to join in. In 1892 C O Wickenden was hired to build a new store on Granville Street, near the CP’s Hotel Vancouver, their opera house, and many other office buildings developed by CP Directors. Some were involved in the Hudson’s Bay Company – so that probably helped the decision, and the new store was much bigger, so a larger site was needed as well (although initially only two floors were going to be occupied). This 1908 Vancouver Public Library shot shows the store had an array of large picture windows on both Granville and Georgia. Very quickly the growth of the city ensured that all four floors were needed – and then more. We’re unclear when the building became 100′ wide on Granville – it must have been after 1898 (when the image on the right was taken), but before 1901 when the insurance map of the day shows the building above, and it seems likely that Mr. Wickenden was still the architect. In 1913 a new addition, quite a bit bigger in scale and grander in design was added to the east, running down Seymour Street. Even that proved inadequate for the stores’ needs, and in 1926 the brick store was demolished and a further enlargement of the 1913 store was built, designed by Burke, Horwood and White (who had also designed the 1913 store). The creamy white terra cotta design referenced the Selfridge department store in London, and similar buildings went up in Victoria, Calgary and Winnipeg, all designed by the Toronto based architects. The 1926 Vancouver store expansion took just six months to build after demolition of the 1893 structure; the five reinforced concrete floors were erected in just two and a half weeks. These three office buildings were some of the earliest built in the city. 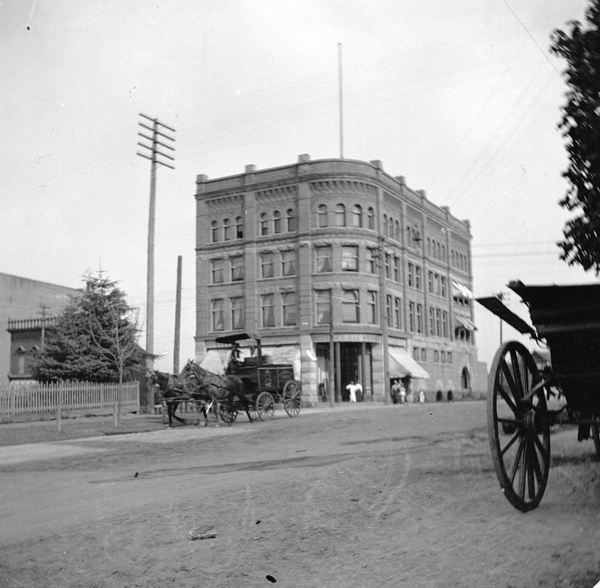 Seen here in 1889 on Granville Street, south from the corner of Georgia were the Donald Smith Block, the Lord Durham Block and the Lord Elphinstone Block. We think all three were built in 1888, and all were part of Canadian Pacific Railway’s efforts to create an instant ‘new city’ on the CPR’s own land, some distance from the more established former Granville townsite down on Water Street. The Donald Smith Block on the corner was designed by Bruce Price, an American with impeccable credentials as a designer, based in New York. He produced a series of designs from 1886 to 1888 for CPR sponsored buildings, including this 4-storey building named for Lord Strathcona, the Scottish born Canadian co-founder of the CPR (with his first cousin, Lord Mount Steven). 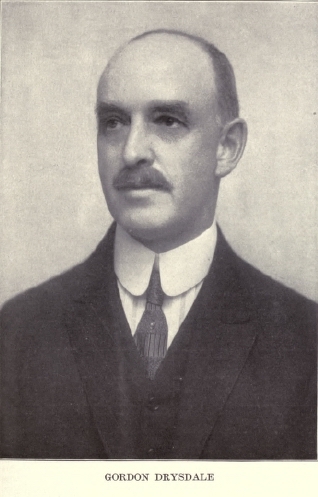 As a CPR Director there was an expectation that Sir Donald would invest in a building to encourage the growth of business in the new city (and particularly that part controlled by the CPR). Next door was the Lord Durham Block. This one is more of a mystery: we haven’t traced an architect, and we initially were not completely sure if the Lord Durham of the day, The 3rd Earl of Durham, John Lambton, was associated with the CPR, although a contemporary 1888 publication certainly implies that he was. There’s also a building permit in 1902 for repairs to the building issued to ‘Durham, Lord’. Lord Durham’s grandfather, an English peer, the 1st Earl, also called John, had earlier connections to Canada. He was a political reformer who in December 1837 was asked by Lord Melbourne, the British prime minister, to solve the Canadian situation after rebellion had broken out in both Upper and Lower Canada. He was promised virtually dictatorial powers as governor-in-chief of the British North American colonies and high commissioner, but didn’t last in the job very long. After his short stay in Canada he wrote a report in 1838 that proposed merger of Upper and Lower Canada and the creation of responsible government, in which the governor general would be a figurehead and the legislative assembly would hold a great deal of power. In the responsible government, the legislative assembly would be elected by the people, and the party with majority would hold power – as long as they held support, they would keep power. The merger would eventually come ten years later. There’s a woodcut of the Lord Durham Block in an 1888 publication which shows a very English looking building. In 1889 the Daily World reported “The alterations to the Lord Durham block are approaching completion. The store windows, and those of the upper storeys as well, have been enlarged, and the general appearance of the block has been so changed that it would be difficult to recognize it. The new upper cornice is a great improvement to the building. 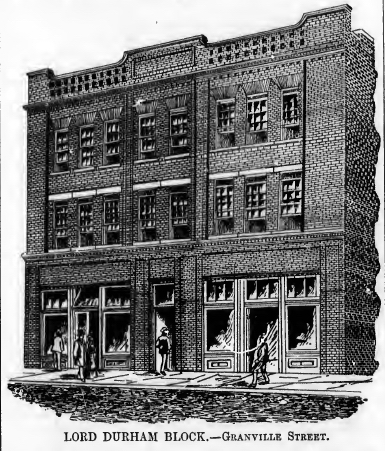 T. Tompkins, the contractor, has reason to congratulate himself on the success of the work, as the building looks very much improved since the alterations have been made.” There’s no way of being sure, but we think the photograph above is the revised building – there’s an 1893 image that shows the building looking the same as it does here. While we haven’t identified the architect, we can rule one candidate out: a Daily World article in 1888 reported that Bruce Price of New York was the architect of a number of new buildings with the exception of the Lord Durham and Lord Elphinstone Blocks. It reported that each of the three were costing about $26,000, and that Mr. Tomkins was contractor for all of them. The Lord Durham Block was where the congregation of Christ Church met while they tried to raise the funds to build their church; often in cramped and stuffy conditions if reports from 1889 are accurate. The third building is the Lord Elphinstone Block, designed by Montreal architects John and Edward Hopkins, a father and son team who also picked up another CPR commission for the Opera House up the street. Unlike Lord Durham, we are quite certain of Lord Elphinstone’s involvement in the CPR – he was their man in London. He was one of the British subscribers who bought shares in the company, and was also a founding director of the Canada North-West Land Company (with Donald Smith) incorporated in 1882 to buy five million acres of land along the route of the railway from the CPR, (later changed to a mere 2.2 million aces) including forty-seven towns on the CPR main line. We can probably rule out the possibility of the Hopkins’ designing the Lord Durham Block, as the list of their works is comprehensive because it comes from the ledgers recording their income. Despite their early importance, the buildings didn’t last very long. In 1912 the Birks Building went up here, only for it to be tragically replaced in the mid 1970s by the uninspired Vancouver Centre. We’re reasonably certain this building was constructed in 1907, added to in 1912 and again in 1919. 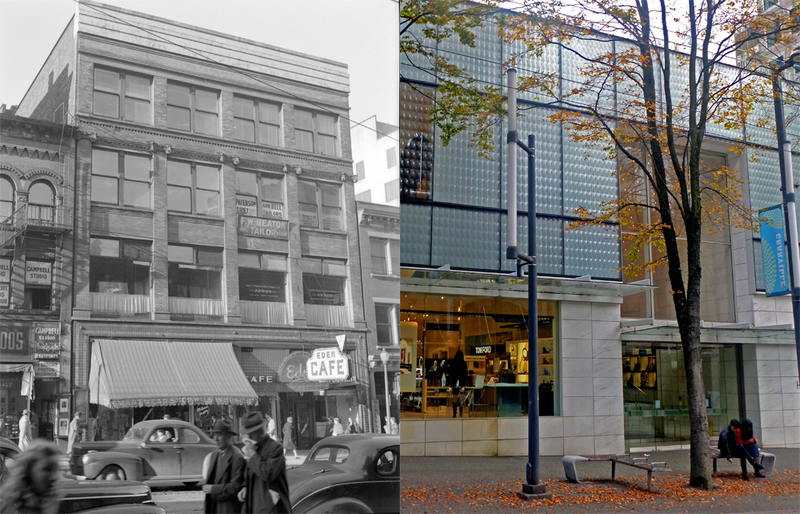 Hooper & Watkins designed a building for Gordon Drysdale in 1907 on Granville Street – and this is where that company was based. In 1912 the building had a $9,000 addition, designed by S B Birds of ‘mill construction’ – which we’re guessing was the top floor. In 1919 Gardiner and Mercer designed another $4,000 addition, “Repairs; addition of brick construction w stone trimmings to present premises; addition 25×40 ft, intended to furnish add’l accom. for firm’s growing business”. Gordon and his wife Maria, and both their older children were born in Nova Scotia (George in 1888 and Janet in 1892), but their youngest son, Norman, was born in BC in 1895. Like many of our successful businessmen and developers, the Drysdale family lived in the West End at 825 Broughton. He was born in Truro, Nova Scotia into a farming family with Scottish roots, and at 15 apprenticed with a mercantile company, setting up and managing a branch store in New Glasgow from 1881 to 1884 (when he was aged 25). That year he partnered with his brother, Dan, but they soon parted company with Dan moving west and Gordon running the business on his own until 1892, when he brought his young family to Vancouver, buying out the general merchants Haley & Sutton on Cordova Street. He moved to the corner of Cambie & Cordova in 1899, and the to Hastings in 1903, partnering with Charles Stevenson as Stevenson & Drysdale. Victoria-based rival David Spencer wanted to open up, buying Stevenson out first, then a year later Drysdale, who moved to new premises on Granville Street. A 1914 biographical portrait describes the business “His is the finest exclusive store in Vancouver, or in all western Canada, an extensive stock of high-class goods being carried. The store is most attractive in all its equipments and appointments and courtesy on the part of all employes is demanded, patrons receiving every possible attention. The company was the first in Vancouver to inaugurate six o’clock closing, and in 1912 they introduced the plan of closing on Saturdays, during July and August, at one o’clock. They are practically the only firm in the city today who follow this practice and have naturally earned the thankfulness of their employes, whose loyalty to the house has been greatly increased by this measure. The store further enjoys the enviable reputation of employing only first-class help and paying therefor first-class salaries. Unlike almost all the successful businessmen we have come across “Mr. Drysdale is a member of no clubs or societies, preferring home life when not occupied with the cares of management of an extensive business.” The Library have a 1922 shot of the building’s interior, rather daringly featuring the lingerie department. Gordon died in 1932, aged 73, survived by his second wife, Hilda, Maria having died at home on Broughton Street in 1926, aged 64. Next door to the south, we looked at 559 Granville in an earlier post. By 1945, when this picture was taken, 579 Granville was occupied by tailors Paterson & Bell, and F W Beaton – civil and military tailor. They had their signs on the third floor, and shared the floor with manufacturers agents in other suites. On the second floor were Cluett, Peabody & Co who were agents for Arrow shirts and collars. 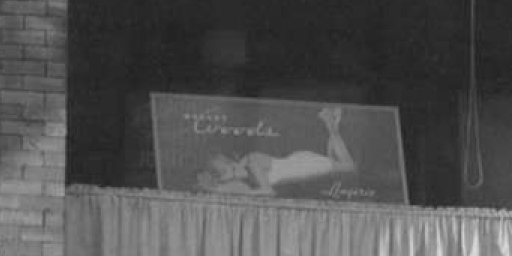 The York Knit Mills had been here, but were replaced by Woods lingerie who had their advert peeking over the lace curtain. There was a wholesale jeweller on the top floor, and the main floor had Wilson’s glove and hosiery store and the Eden Café. When homeless veterans occupied the vacant Second Hotel Vancouver (two blocks up the hill) in 1946, the Eden supplied 150 meals. The Lyric Theatre replaced Canadian Pacific’s Opera House that they built next door to their Hotel Vancouver (or more accurately, next to the addition designed by Francis Rattenbury). The first version of the Opera house was completed in 1889, and significantly rebuilt A few years later. After a fire, this version opened as The Orpheum Theatre, built at a cost of $160,000 in 1912 by new owners, US impresarios Sullivan and Considine. 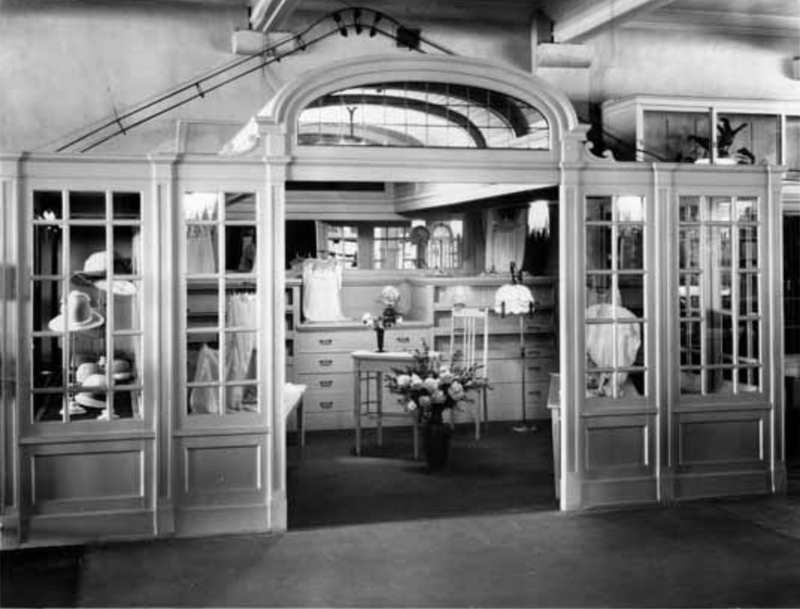 The architects were hired locally; Donnellan and Donnellan, originally from Seattle specialised in theatre design. In 1928 it was known as the Vancouver Theatre, although the office space on the street front was still known as the Orpheum Building, (a name it retained for many years). The Orpheum Theatre name moved south and across the street in 1927, where it was initially known as The New Orpheum. In 1935 this building was renamed as the Lyric, still showing vaudeville, but also movies. In 1947 it became the International Cinema, and it wasn’t a theatre any more, but rather a Famous Players movie house until 1960 when it reverted to the Vancouver Theatre name, before closing in 1969. It was demolished for the new Eatons department store, recently given a new lease of life as Nordtroms with, once again (for the first time since 1969) office space on the upper floors. Here’s a 1927 view of the Pacific Centre across the Courthouse plaza (soon to get a comprehensive makeover as a paved area lined with trees). We’ve seen this area before, but looking the other way. We’ve been waiting to attempt this shot as the Pacific Centre rework of the former Eatons / Sears store has only just been completed. The Courthouse on the right really hasn’t changed, although the existing trees hide it a bit. The huge flagpole has gone, as has the second Hotel Vancouver that we wrote about a few years ago. The courthouse was originally designed by Francis Rattenbury in a grand neoclassical structure in 1906. Six years later it was expanded in a less flamboyant (and cheaper) style by Thomas Hooper. Once Arthur Erickson’s new courthouse was completed in 1982, the Vancouver Art Gallery moved here after extensive alterations, also designed by Erickson’s office. The second hotel was one of the city’s finest buildings, and its loss was very regrettable, but understandable as its replacement was so large that the two could never have successfully have survived together at the time, even if there hadn’t been a deal that ensured it closed. It was demolished in 1947 and only replaced in the early 1970s with Cesar Pelli’s TD Tower, and his white concrete Eatons store, recently reclad and repurposed as offices and Nordstrom store to a design of James K M Cheng. The corner building on Granville and Davie was a bank for many years. The first buildings here were two storeys high, built around 1901, and we haven’t found an image of them. The corner was initially the Braden Meat Market, and from 1908 to 1916 the corner store was the West End Meat Market. In 1916 the building in the image above was designed and built by Bedford Davidson for P Burns & Co at a cost of $5,000. The West End Meat Market was part of the meat empire controlled by Pat Burns. Four years later builders Coffin & McClennan carried out $500 of repairs for the Royal Bank of Canada – who were the tenants from when the building was constructed. The building didn’t really change its appearance from when it was built until 1931, when our Vancouver Public Library image was taken. We have an image that shows the left hand side of the building in 1916, and the only significant difference was the lack of any awnings. We assume that at some point the Bank acquired the building; in 1952 they replaced it with a two-storey structure (that’s still standing today). We haven’t identified the architect, but the most likely candidates are Mercer and Mercer, the father and son partnership who had a contract with the bank to design new branches throughout the province. Our 1970s image shows the bank still in operation; in more recent years it has been a Chinese restaurant, but that’s also likely to change soon as there’s an approved replacement residential and retail building that will be seven storeys. This early 1974 image shows the second of the ‘dark towers’ of Pacific Centre under construction. The IBM Tower, as it was first known, was a shorter sibling to the TD Tower to the south and slightly west, completed a couple of years earlier. The steel framed towers were designed by Cesar Pelli who was at the time working for Victor Gruen Associates in Los Angeles. Many descriptions identify the design as ‘Miesian’ after the architect Ludwig Mies van der Rohe, who perfected the simple structured office tower – one of the best examples is the Seagram Building that he designed in 1958. In Canada his Toronto-Dominion Centre was the real thing; like the Pacific Centre it was developed by Fairview Corporation five years earlier than the pacific Centre in 1967, with Mies as design consultant. Vancouver’s was similar in many respects, but the towers’ colour was slightly richer; more brown when the sun hits it than the dark bronze of most Mies buildings. We can date this image from the construction of the tower, and from the street. 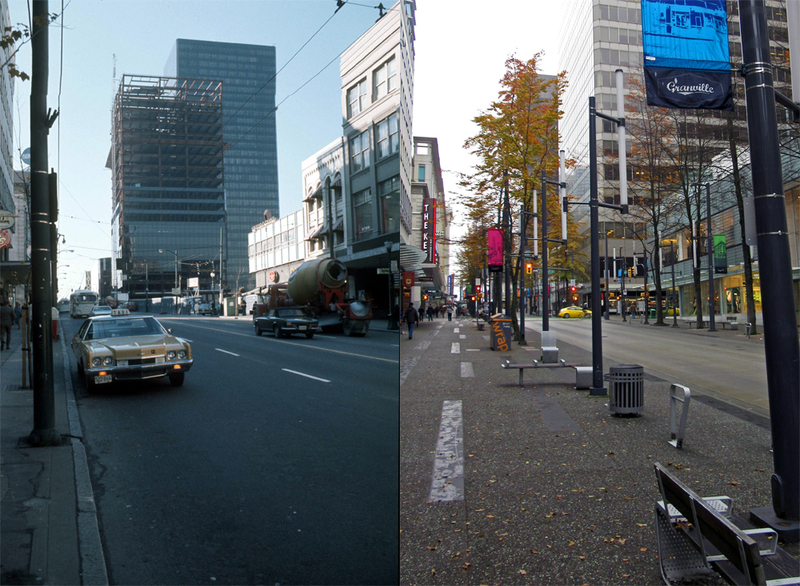 In 1974 Granville was designated as a transit mall, and general traffic was removed. The 2010 redesign widened the sidewalks and straightened the streets. Public consultation responses also led to the street trees in this stretch of Granville remaining in place. (Elsewhere they were replaced with more appropriate varieties than had been planted previously). The ‘Dark Towers’ of the Pacific Centre as they were known at the time (and not the “towers of darkness” quoted more recently) were not universally welcomed. Later phases of the project were approved on the understanding that they’d be lighter coloured; the Cannacord Tower (as it’s now called – it started as the Stock Exchange Tower) at 609 Granville was completed in 1981 with a paler beige finish. It was the fourth tower to be completed after the Four Season Hotel, which was also lighter. Here the glazing and panels on the office are pretty much the same dimensions as the darker towers; it’s just the colour that changed. McCarter Nairne are credited with the design, but Cesar Pelli was still involved. After nearly a decade another phase of the mall was built to the north, with a corner store for Holt Renfrew. It replaced a modest 1960s 2-storey building and was redesigned a couple of years ago by New York designers Janson Goldstein as this image (and an earlier post) show more clearly. It replaced the Tunstall Block from 1902. The small building next door with the arched top floor windows was originally designed by G W Grant for builder (and owner) Bedford Davidson in 1903. A year earlier the same team had built the two small buildings two buildings further north (hidden by trees in the 1981 image), while the four storey building with the Ingledew’s Shoes mural is the work of Hooper & Watkins who designed the building in 1907 for Gordon Drysdale (with a later addition by S B Birds).